:Often we convince ourselves that we're strong enough that we have control over our lives. At other times, we have no choice but to wave the white flag high. We fall on our knees in surrender before our Lord and maker, pleading for enough strength to simply get through the day ahead. Early in her career as a nurse, author Tricia Metzger-Osting cared for a young mother suffering from arteriovenous malformation (AVM), a condition that only one percent of the population is born with. Often presenting with severe headaches, AVM can lead to bleeding into the brain. If not diagnosed in time, the outcome can be fatal.? ?Within weeks of caring for this young mother, Tricia's boyfriend was diagnosed with AVM. Suddenly, Tricia was experiencing the STICU from the inside out and gaining an up-close understanding of how her patients feel. In an unexpected position, and in the darkness of the unknown, she cried out to God to intervene in her future husband's life. 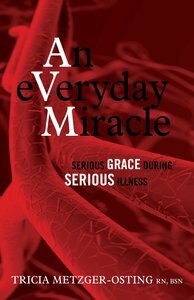 An Everyday Miracle is the true story of a young couple's struggle to surrender their circumstances to God. Through their ordeal, they gained peace and a new understanding of God's path for their lives. It's an encouraging story for those in the trenches, right now, waving the white flag high. When the scale tips, and life hangs in the balance, An Everyday Miracle reminds us that God has a plan, and we can trust him.